Yesterday I reviewed Charles S. Faddis’ new book, Codename Aphrodite (Orion, 2011), a gripping novel about a former CIA case officer’s freelance operation in Athens, Greece, in pursuit of November 17, one of Europe’s most notorious urban guerrilla groups. Today intelNews hosts an exclusive interview with Faddis, a straight-talking ex-CIA clandestine operations officer, who admits that his novel “is based on some very personal experiences” and that many of the book’s characters “are drawn much more from memory than they are from imagination”. 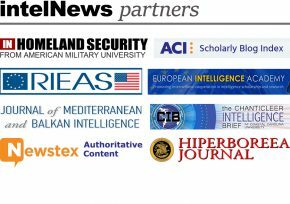 Most regular readers of this blog probably know Charles “Sam” Faddis as the former head of the US National Terrorism Center‘s WMD Unit. His 20-year career as a CIA operations officer, with posts in South Asia, Near East and Europe, arguably culminated in 2002, when he led a CIA team into Iraq to help prepare the ground for the US invasion. He documented this in his 2010 book (co-authored with Mike Tucker) Operation Hotel California: The Clandestine War Inside Iraq. Following his 2008 retirement, Faddis, who was CIA Chief of Station in his last overseas tour, frequently comments on intelligence matters, most notably in his 2009 exposé Beyond Repair: The Decline and Fall of the CIA. Faddis’ answers to intelNews‘ questions are below. All of your previous books have been strictly non-fictional. What made you turn to fiction, with Codename Aphrodite? Sometimes you can tell more truth with fiction than you can with fact. I can’t write a book that details sensitive aspects of real world ops I have run. If I fictionalize it, however, I can tell basically the same story and still protect those things that need to be protected. Codename Aphrodite is, at many points, essentially a street-level view of the way ops are run. Why did you choose November 17 as the subject of your book? Some of those who know you claim that you “traded a few punches with November 17” during your CIA career. Does this explain your choice of subject? Let’s put it this way: Codename Aphrodite is based on some very personal experiences. There are a lot of characters in the book that are drawn much more from memory than they are from imagination. Elsewhere you have said that November 17 was able to remain active for so long because Greek political and security circles lacked “the political will […] to allow them to aggressively pursue the fight against organized crime and terrorism”. In Codename Aphrodite you pursue the view that there might have been come degree of collusion between November 17 and elements of Greece’s political establishment. To what extent is this a fictional element of your narrative, and what is your personal opinion on the matter? In terms of the details, this is fiction. Anybody who is looking through the book and trying to draw direct parallels between characters in the novel and real people is wasting their time. On the other hand, I think there is a lot of truth to the central point. 17 November was a very dangerous organization, but it was the support, witting and unwitting, of many individuals in Greece that allowed it to exist for as long as it did. Is the chapter “November 17” closed, in your opinion? Do you think the organization has truly disbanded, and do you believe that, with the group’s operational demise, the era of ‘new-left’ urban guerilla movements in Europe is finally over? No. I don’t think that we are anywhere close to the end of this story. New terrorist groups appear in Greece all the time. Throughout Europe, in fact, the leftist-anarchist movement that spawned 17 November, the Red Army Faction, Action Directe and the Red Brigades remains alive and well. We have lost track of the history of these groups after this decade of Islamic terror, but European groups historically have been the most professional and disciplined groups in the world. I am afraid, especially with the economic problems we are seeing on the Continent, that we are likely to witness a resurgence of such violence in the future. Your experience in intelligence is operational, rather than analytical. However, would you share some of your personal thoughts on the economic situation in Greece and the European Union as a whole? How do you think that the economic crisis might affect internal security patterns in Europe? I believe that we are seeing the beginning, not the end, of economic problems in Europe. Also, keep in mind that up to now most of the noise has been about what austerity measures should be adopted in the future. The actual cuts have only just begun. As people throughout Europe, and particularly in Greece, Italy and Spain, actually begin to have to live with cutbacks in spending, the level of anger and frustration is only going to rise. The heart of the anarchist district in Athens is Exarcheia, where much of Codename Aphrodite takes place. This district is right now, today, a “no-go” area for the Greek police. They literally do not enter that part of the city because of the reception they will meet from the leftist community there and the anarchists on the street. Just wait until Greece starts making significant cuts to its public sector, laying off government workers and cutting benefits. It will be like gasoline on a smoldering fire. Codename Aphrodite takes place in Athens. During the Cold War, Athens was sometimes described as part of one of Europe’s most active “espionage triangles”: Athens-Ankara-Nicosia. Do you agree with this view, and, if so, do you think that intelligence activity in that part of the world has simmered down in the post-Cold-War period? The American Indians used to reserve Kentucky as a hunting ground for all tribes. That’s sort of the way the area you described was for espionage during the Cold War. Since then the targets have changed some. These days the spy game is less about Russian missiles and more about loose radiological material and terrorist networks. But the region is still just as active. I spent a large portion of my career on the streets of all three cities you mentioned. Your realistic and visual treatment of post-Cold-War Athens in Codename Aphrodite is captivating. Is the pictorial realism in the book a literary trait, or something that comes from your training, in the sense of being cognizant of your surroundings in the field? I hope that some of the flavor of the book is a reflection of my ability as a writer. When I am writing, though, I am drawing on my real experiences and, in most cases, describing places I have really been. Maybe it’s training. Maybe it’s instinct. Maybe it’s a little bit of both, but I can see most of those places in precise detail to this day. In the field, when you are running assets and dealing with very dangerous people, you have to have the ability to see everything around you, know how it fits together, recognize the one thing that is out of place and react. The book’s protagonist, former CIA clandestine officer Bill Boyle, relies on careful spy craft but also very much on instinct. Fictional accounts of intelligence often ignore the importance of (trained) instinct in spy craft. Why do you think that is? I think that very few people in this world really understand how the business of espionage, of recruiting and running human sources, works. I’ll take it a step further. Most people in the Intelligence Community don’t know how it works either. It’s not a science. It’s an art. Only a very small number of people are ever going to be truly good at it. Training will make a guy better, but if he does not have the natural instincts to survive on the street and find his way in the wilderness of mirrors you cannot fix that. Bill is an example of a guy who has that ‘edge’. In Codename Aphrodite, Bill Boyle’s relationship with the CIA is not exactly warmhearted. What has your own relationship with the CIA been like after writing Beyond Repair, and what feedback did you receive on the book from colleagues —retired or active? Here is the way my relationship with the Agency works: I write something. A hundred guys I know who are still inside call me, text me or email me to tell me how much they appreciate what I am saying and ask me to keep speaking up. Then some reporter goes to Public Affairs at [CIA] Headquarters and asks for some official comment on my statements. In response, Public Affairs usually says something to the effect that I have no idea what I am talking about and everything is fine in the Agency. I can live with that. If the day ever comes that the guys on the street think I’m lost and Public Affairs agrees with me, then I’ll be worried. In 2002, you led the first CIA team of operatives in Iraq, in preparation for the March 2003 US invasion. Considering recent developments in Washington’s “war on terrorism” (bin Laden’s death, the impending exit of US forces from Iraq/Afghanistan, etc), how would you evaluate its current status? The Central Intelligence Agency is filled with literally thousands of the most capable, dedicated professionals the United States has ever produced. Those individuals perform miracles every day. But the fact remains that the Agency is dangerously close to becoming just another federal bureaucracy. It is risk-averse. It is dominated by individuals at the senior level who are more concerned with personal advancement than they are with accomplishing the mission. The world is getting more and more dangerous all the time. We cannot afford to let the CIA muddle along. We need to reform it, and we need to do that now. What we need is a new OSS. I don’t mean that we should literally recreate the exact organizational structure of the Office of Strategic Services in World War II. I mean that we need to recapture the qualities that made the OSS so effective. We need a flat, flexible, nimble organization, one that can move as fast as terrorist organizations do. We need an outfit composed of tough professionals who are prepared to climb into all the dark, dirty, dangerous holes on the planet in pursuit of their objectives. We need an intelligence organization that can get inside drug cartels, terrorist organizations and networks smuggling radioactive material and keep this country safe. As an seasoned clandestine operations officer, do you have a favorite list of fictional or non-fictional books on intelligence that you would recommend, based on their realistic depiction of what working for the CIA is like? Honestly, there are very, very few books that even begin to reflect what it is actually like on the street. Out there in the back alleys, things are often very dangerous, very gritty and very personal. It’s not about high tech gizmos and space age technology. It’s about thinking on your feet and, when necessary, being absolutely ruthless. If there is one other author I think begins to capture that, I would have to say [it is] David Ignatius. He knows a lot of people inside, and you can see that in his writing. Will Bill and Eleni come back for a sequel to Codename Aphrodite? Or do you intend to return to non-fiction for your next book project? The sequel to Codename Aphrodite is going through copy editing right now, and I have started work on the third book in the series. I hope that Bill and Aphrodite have many, many adventures ahead of them. I don’t think that a new OSS can be created within the existing CIA structure. CIA is now primarily an analytical agency, a bureaucracy in the administrative sense of the term. What is needed is a new agency, separate from the CIA, that can take on operations. I agree with the emphasis on operations, but why create yet another intelligence agency? Aren’t there enough already in the IC? We should be disbanding or merging several of these agencies, not creating new ones. It is possible to co-house analysis and operations in the same organization. Other countries do it, why can’t we? @Erasmus – That seems as much a political question as a strategic one. Perhaps another administration will make a focus. Great questions and even better answers. Sam Faddis is dead-on about the agency. Let’s get back to basics; international law enforcement cooperation to hunt down and squash the real bad guys,, or continued farcical and tragic military operations to control resources in the guise of hunting terrorists? Come on fellows,, either you get on the bandwagon for real peace or you continue to play the same old game of us against “them” . While we occupy countries there will always be enemies for us to shoot. Put all that slick CIA special ops to practice where it might reveal the REAL scoundrels of this world; the bigwigs who are profiting from all the heroin coming out of Afghanistan. ( Any comment on our involvement in that nonsense?) The world still has no sheriff. This makes it way too easy for the bad guys to keep winning. And one more thing,,,, if you really want to hunt bad guys and crooks,, we’ve got plenty right here at home,, and the best way to reveal them is not by advertising for new bodies to wear uniforms. Plenty of work for talented and lethal special ops types to do right here at home,,, like the cartel coke dealers who are at work in every American city. Not as glamorous perhaps, but just as dangerous. The more we spend money foolishly in other parts of the world, the harder the crooks and dealers here at home laugh at us. Just my two cents. Hi will be it be published also in paperback? Codename Aphrodite will be out in paperback at the beginning of October. The sequel will be released as an ebook and in paperback before the end of the year. I hope for the sake of Americans and all lovers of democracy that SAM will run the Oval Office one day.